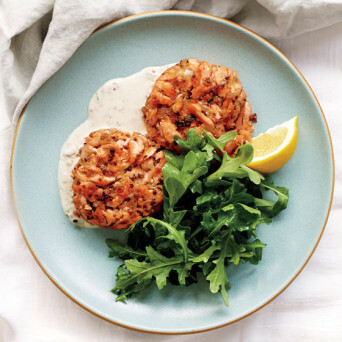 This mouth-watering salmon cake recipe was made by Chef Perry Bentley as a signature recipe for the canned Okanagan Select Sockeye salmon. It was served at Feast of Fields to 800 guests, and the guests thought this salmon cake tasted gourmet restaurant quality. Chef Perry thought the aroma and taste of the Okanagan wild Sockeye salmon is outstanding, and he is proud that the salmon is on the Worlds Healthiest Foods list.